The thought of having his number retired one day crossed Mike Modano’s mind occasionally during his 21-year NHL career. The dream becomes a reality for Modano Saturday, when the Stars will retire his No.9 at a ceremony at the American Airlines Center. And the Stars are making sure the event is worthy of the greatest player in franchise history. Stars president Jim Lites called on VP of Business Development Dan Stuchal to help plan the event. Modano, who has played a key role in planning Saturday’s event, will be the fourth player to have his jersey retired by the Stars franchise. Bill Masterton (No. 19), Bill Goldsworthy (No. 8) and Neal Broten (No. 7) are the others. Broten will be on hand Saturday as well as family members of both Masterton and Goldsworthy. There will be other guests, some the Stars haven’t made public. Among those known to be attending include several members of the 1999 Stanley Cup championship team who will be prominent in the Green Carpet event at the AT&T Plaza that will kick off the festivities at 4:30 p.m. on Saturday. The number retirement ceremony will start right at 6 p.m. featuring Modano, guests and video presentations. The Stars are encouraging fans to get to American Airlines Center early. Parking lots open at 4:00 p.m., and the Stars say people should be in their seats by 5:45 for the 6 p.m. ceremony. Of course, Modano will be center stage. It’s his night, and it’s sure to be an emotional one for Modano, a guy who was emotional when he played his last game in Dallas and got emotional when announcing his retirement from hockey. Chances are he will get emotional Saturday night. 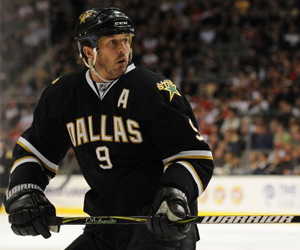 It will be a night to celebrate Modano’s career, and his impact on hockey in Dallas. Modano’s numbers are well documented, and speak for themselves. He’s the Stars franchise leader in just about every offensive category, both regular season and playoffs. He’s the all-time leader among U.S-born players in goals and points. But Modano was more than numbers. He became a superb all-around player and that was key in the Stars becoming one of the league’s top teams in the late 1990’s. Jere Lehtinen, Modano’s longtime linemate, was right there by his side. And Modano helped take the Stars to the highest level, winning the Stanley Cup in 1999. That run to the Stanley Cup provided Lehtinen’s most memorable Modano moment. It was Modano playing through a broken wrist as the Stars defeated Buffalo in six games in the Stanley Cup Final, and then the raw emotion Modano showed when he hoisted the Cup. Modano’s skill, numbers and his commitment to winning are some of the reasons his No. 9 is going up to the rafters. A number he picked as a kid and one that stuck throughout his career. Other players have chosen No. 9 because of Modano. Among them was Bobby Ryan, who wore that number in Anaheim and said he picked it because of Modano. “It’s kind of neat that a younger group of guys did that because of me,” Modano said. There have been a lot of people wearing No. 9 on hockey jerseys around Dallas over the years. There still are. That’s because Modano helped sell hockey in Dallas and in the Southwest when the franchise moved to Texas from Minnesota in 1993. And Modano enthusiastically did what he could to promote the Stars and the game of hockey in Dallas. And Saturday night the Stars will honor Modano, raise his No. 9 to the rafters, as a tribute to what he accomplished on the ice and off it for the franchise.